In order to enjoy the game you've got to set the mood. Here are 5 things to improve the quality and comfort of your Super Bowl experience. As this post publishes, Superbowl XLVIII is 2 days, 1 hour, 35 minutes and …45…44…43 seconds from kick-off—at least according to the official countdown clock on the NFL site. If you are not one of the 80,000 lucky fans who will be cheering their team to glory at the MetLife Stadium, East Rutherford, NJ, on Sunday, you will surely be catching the game with friends at a Superbowl party, sports bar, or from the comfort of home. This Mitsubishi 3D DLP® Home Cinema features a huge 73″ screen that offers a larger than life, intensely vivid 2D and fully immersive 3D viewing experience. You can find it at Sam’s Club for $1,999 (after $700 instant rebate online). If you’re looking for something a little bigger, be on a the look-out for Panasonic’s newest introduction: a 152-inch 3D Plasma—the biggest TV created. You can’t enjoy the game without sitting in comfort. This Catnapper 6420 Top Gun Power Recliner is a man cave must-have. Featuring roomy bucket-style seating, extra plush padding and excellent lumbar support, the chair is upholstered in a manly, but soft black bonded leather. It comes with a built-in cup holder and can be ordered with wedge table for snacks. On sale for $649 from Sofas and Sectionals. 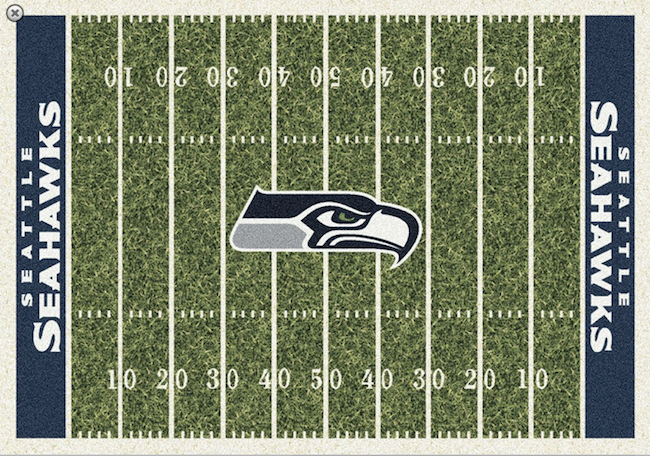 Regardless of whether you are a Seahawks or Broncos fan, you can show some support and provide a little comfort and warmth underfoot, too, with an NFL team-themed rug. This one is made of well-wearing nylon making cleaning spills a breeze, and comes in four sizes, including a 7’8″ x 10’9″ for $449. Available at RugLots.com. Keep the drinks chilled with this generous-sized, galvanized metal ice bucket from the Northwest Company. In addition to being a man cave must-have, the handles make it ideal for parties, tailgating or camping. Officially licensed by the NFL, this New England Patriots ice bucket is available on Amazon for $22.69. 5. Grab some snacks—lots of snacks! Like this update on the popular “pig-in-a-blanket” concept, made with Pillsbury Crescent Rolls and cheese.